Gelato di Natura, Gran Viale Santa Maria Elisabetta, Lido. Lido is a beach town and it's in Venice so naturally there is gelato on almost every corner. 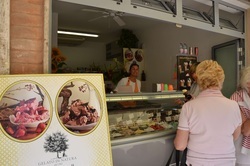 But for a very special artisnal gelato treat on Lido, this is the place to go! Using only fresh and organic ingredients, this shop scoops up some of the most flavorful and refreshing gelato in all of Venice. And they're somehow managing to do it at prices that are actually lower than many of the other shops. 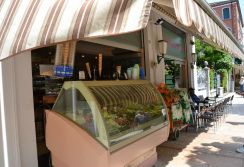 How to Get There: Gelato Di Natura is located on the Gran Viale Santa Maria Elisabetta about half way between the main boat stop and the entrance to the main public beach. If you're coming from the vaporetto, you won't regret bypassing the big ice-cream counters and holding off until you get here. If you're coming from the beach, Gelato di Natura will be one of the first gelato shops on your right. Garbisa, 51/c Gran Viale Santa Maria Elisabetta, Lido. From the outside Garbisa looks like any other big cafe on the Gran Viale, but inside it's actually an excellent pastry shop that also serves good sandwiches, coffee and drinks all fresh and all at reasonable prices. It has a great laid-back atmosphere and a staff who are really friendly and fun. This is just a fantastic place to stop into for quick lunch on the way to the beach or to pick up something sweet on the way home. 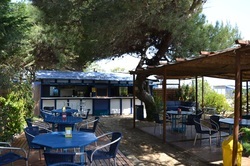 How to Get There: Garbisa is located on the Gran Viale Santa Maria Elisabetta on the north side of the street between the boat station and the entrance to the main public beach. Coming from the boat station it will be on your left about 1.5 blocks past the BILLA. From the beach it will be on the right about two thirds of the way down the street. La Strambata, 2 Via Ca'Rossa, Alberoni, Lido. 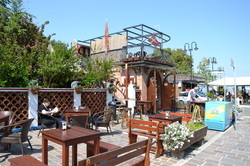 A favorite pit stop on the trek between the Alberoni beaches and downtown Lido. La Strambata is everything a beach town bar should be and more! The space itself is awesome. You can sit on the sidewalk and take in the sun and a view of the lagoon, or opt for the large shaded garden with marble tables and a bubbling fish pond. The atmosphere is friendly and relaxed. Plus they usually have unusual and tasty cicchetti and crostini to snack on. How to Get There: La Strambata is a two minute walk from the "Alberoni" bus stop, or a fifteen minute walk the Bagni Alberoni beach club. From the Bus Stop: Get off the bus at the "Alberoni" stop. (It's the stop before the beach.) You are on a short street in what looks like a small town. La Strambata is the bar on the south side of the street one-in from the water. From the Beach: Leave the Spiagia Alberoni by way of the center pavilion of the Bagni Alberoni Beach Club and follow the dirt road leading away from the beach. The dirt road will meet a paved road and curve to the right. Stay with this road until you get into town. Cross the street and continue forward until you find La Strambata on your left. Chiosco, Alberoni Beach, Very Close to Bagni Alberoni. When you're out on the vast undeveloped beach at Alberoni it's easy to think that your only option for getting a snack and some shade is to go into the huge Bagni Alberoni beach club. Not so. Chiosco is a relaxed little bar with a shady terrace immediately adjacent to the club where anyone can just wander in off the beach, enjoy a drink and cool off for a minute. How to Get There: Coming from the Alberoni beach, head for the Bagni Alberoni Beach Club. It will be the only developed beach area near bye. Rather than walking into the club pavillion, stay to the right. Chioscho is near the club building on the right hand side. It's somewhat hidden by folliage but there is a small sign and a path into the bar.